The diplomatic process between the United States and North Korea that began last year is fragile after the collapse of talks between Donald Trump and Kim Jong Un in Hanoi. One more wrong move by either side could bring the entire house of cards tumbling down, taking South Korean President Moon Jae-in’s inter-Korean dreams with it. We came perilously close to that with the recent confusion over possible new US sanctions. Trump tweeted that he had asked his Treasury department to withdraw new “large scale” sanctions, which turned out to be a much smaller set of two designations against Chinese companies. Hanoi summit, that Pyongyang had reassembled two important sites that it had dismantled last year following the Singapore summit between Trump and Kim. Beginning in mid-February, a missile engine test stand and a satellite launch vehicle assembly building at the Sohae launch site were put back together. No doubt, Hanoi was an embarrassment for both leaders. For Kim, the risk of going to Vietnam may not be so apparent to outside observers. Even as North Korea appears as an authoritarian monolith to the outside world, it, like any other country, has internal politics. Kim faces prominent detractors within his regime who do not favour his outreach to the United States over the nuclear issue at this time. Indeed, a senior North Korean diplomat hinted as much during a rare briefing held on the issue in Pyongyang for foreign diplomats. Choe Son Hui, the official, said Kim had disregarded “thousands of petitions” by “our army, people and workers and officials of [the] munitions industry” and still gone to Hanoi to meet Trump, only to find that US demands remain maximalist. Others have seen the “new way” as a more subtle geopolitical threat to align North Korea decisively with China, its most important economic partner. But the North Korea-China relationship, despite its appearances, has been beset my mistrust. Even though Kim has met Xi more times than any other leader, the two have yet to meet since Hanoi. Remember: Kim made sure to brief Xi after the Singapore summit last year. 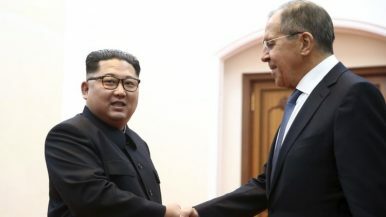 What has been notable since the Hanoi summit is the frequent mentions of public events and negotiations with Russia in North Korean state media. Kim has yet to convene a summit with Russian leader Vladimir Putin despite reports of discussions ongoing between the two sides since last year. “Russia is a neighbouring country of the DPRK and DPRK-Russia ties are the friendly relations with a long history,” the Korean Central News Agency said in a recent article, emphasising ties between the two countries. “The two countries have a shared aim of opposing foreign interference and pressure and defending their sovereignties,” it said. Kim no doubt has recognised Russia’s ongoing geopolitical divergence with the West as an opportunity for Pyongyang. In March, state media reported on three major engagements with Russians, including a reception held by the ambassador in Pyongyang and a visit by a Russian parliamentary group. Even last autumn, during North Korea’s 70th founding day celebrations, Valentina Matvienko was given the front-page treatment on the cover of the national newspaper Rodong Sinmun. Li Zhanshu, Xi’s representative in Pyongyang for the festivities, was relegated to the fourth page. In this context, and especially after the embarrassing outcome for Kim in Hanoi, we shouldn’t be taken aback if North Korea’s attention turns to the opportunities that may be presented by Russia. North Korea’s alignment with Moscow need not be absolute, but it is clearer than ever that Kim is setting up for a significant deepening of Russia-North Korea ties – all at the expense of the United States.